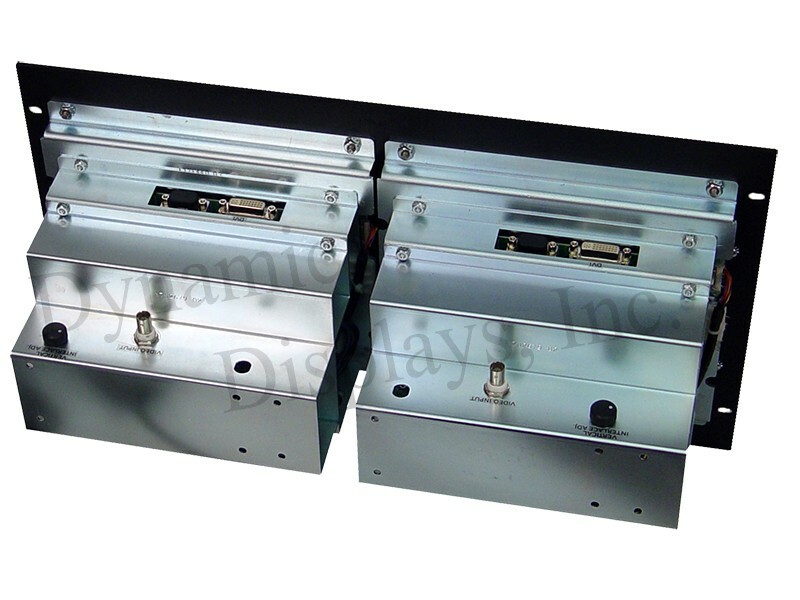 Dual 8.4 In Monochrome RS343 and RS170 Compatible Rack Mount Flat Panel Display monitors. Dynamic Displays’ sturdy rackmount LCD monitors are used in many military, industrial, manufacturing, and transportation applications and other uses that require bright, crisp images and versatile signal interfaces in severe environments. MRD1808-400 Dual Rack Mount 8.4″ FLIR-compatible Monochrome LCD monitor. The Dual 8.4″ Ruggedized Monitor is designed to be a Mil-Spec Compliant Display used for various Military applications. If you’re looking for COTS Military Monitors that use FLIR – Forward Looking Infrared Imaging Systems, the MRD1808-400 series Rack Mount Military Display is an excellent choice for you. 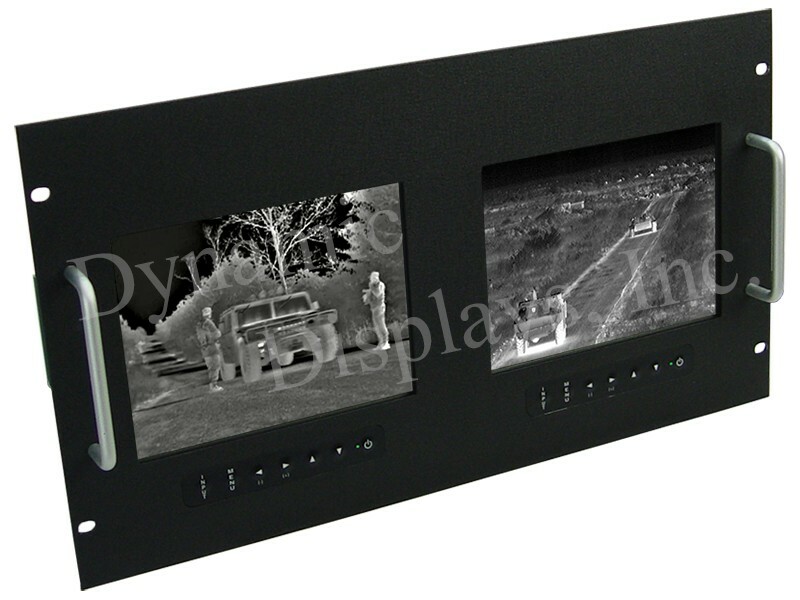 Dynamic Displays' rugged MRD1808-400 Dual 8.4" Rack Mount Flat Panel LCD Monitor is designed to be a Mil-Spec Compliant Display for use in a various Military FLIR-compatible applications that require a high-quality monochrome LCD Rack Mount monitor capable of accepting legacy RS-170 and RS-343 interlace video formats in a high-noise environment. If you’re looking for COTS Military Monitors that use FLIR - Forward Looking Infrared Imaging Systems, the MRD1808-400 Dual 8.4 inch Rack Mount Military Display is an excellent choice for you. This COTS LCD Display monitor features two (2) high performance, 8.4-inch Active Matrix Color TFT LCD panels with reliable, high-bright LED backlights and Bonded Anti-Glare Protective Faceplate Glass for Superior Optical Performance and better protection in extreme environments. The Dual 8.4-inch displays are mounted in a sturdy EIA RS-310 D 19" rackmount chassis. These premium displays accept the analog monochrome RS-170 and RS-343 Video input signal format on a single BNC and NTSC/PAL Composite Video (RCA Jack) and S-Video (4 Pin Mini-Din). High Bright TFT Display: 450 Nits. Analog RGB Sync On Green (SOG) – BNC. High Brightness TFT LCD Option – 1000 Nits. 12VDC, 24VDC or 28VDC Input Voltage. 1:1 or 4:3 Aspect Ratio (OSD Selection). Touch Screen: Resistive, Capacitive and SAW.